A 23-year-old Fitchburg, Massachusetts, man who is accused of murdering an Oakfield resident when an argument broke out over a drug deal two years ago took the stand Monday to blame the crime on someone else. HOULTON, Maine — A 23-year-old Fitchburg, Massachusetts, man who is accused of murdering an Oakfield resident when an argument broke out over a drug deal two years ago took the stand Monday to blame the crime on someone else. 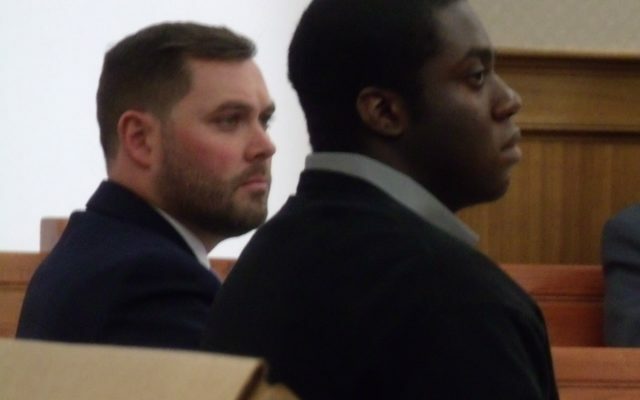 Marcus Asante testified during the fourth day of his murder trial on Monday in Aroostook County Superior Court in Houlton, that Darin Goulding, 29, of Leominster, Massachusetts, is the one who fatally shot Douglas Morin Jr., 31, of Oakfield on Oct. 16, 2016. Prosecutors allege that Asante pulled the trigger as Morin sat in his Lincoln Town Car on the PD Road in Sherman that day. Goulding and Tia Leigh Ludwick, 24, also of Leominster, Massachusetts, were in the car and also charged in connection with the crime. Ludwick pleaded guilty in February to murder and robbery and was sentenced in April to 17 years in prison. Goulding pleaded guilty in February to robbery in exchange for the state dismissing a murder charge against him if he agreed to testify against Asante. He is facing up to 15 years in prison and will be sentenced later this year, according to prosecutors. According to Assistant Attorney General Donald Macomber, Ludwick, who was Morin’s cousin, had contacted Morin about buying ten pounds of marijuana from him. Goulding testified last week that the trio had no intention of paying for the marijuana and intended to steal it from Morin when they met with him on the rural woods PD Road to complete the transaction. Goulding testified that while the group was inside Morin’s car, Morin pulled out his marijuana and asked for payment. It was then, Goulding said, that Ludwick, who was in the front passenger’s seat, grabbed the bag and Morin, who was in the driver’s seat, began tugging it back. He said that he saw Morin brandish a silver gun and that Asante, who was sitting in the back seat behind Morin, had a black gun and began firing. During testimony last week, former deputy medical examiner Dr. Claire Bryce said Morin was shot nine times in the head, neck, right shoulder and hand. On Monday, Kimberly James, a forensic scientist for the state police crime lab, testified that the shot that killed Morin could only have been fired from behind him, which is where the prosecution contends Asante was sitting in Morin’s car. James said that the headrest had areas that tested positive for burned gunpowder residue and for lead, and had areas of dark soot on it. Police also previously reported finding the marijuana stolen from Morin in an apartment that Asante shared with Ludwick in Massachusetts and finding the gun used in the murder in Asante’s closet. They also reported that bullets retrieved from Morin’s body were “consistent” with ammunition found in Asante’s possession. When he took the stand in his own defense Monday, Asante testified while being questioned by defense attorney Brian Kelley that he had saved up $15,000 and borrowed another $5,000 from his cousin to buy 10 pounds of marijuana from Morin. But he told the jurors that when he looked in the duffel bag that Morin had brought, he did not think there was that much in it. An argument broke out and Morin pulled a gun on them, Asante said. That’s when Goulding shot him, Asante testified. Under cross examination from Assistant Attorney General John Alsop, Asante confirmed that he was seated behind Morin in the Town Car, and he also acknowledged that he stole Morin’s marijuana after he was murdered. Because of a scheduling conflict with the courtroom in Houlton, the trial will continue at the courthouse in Caribou on Tuesday. Justice Harold Stewart II is expected to hand the case over to the jury on Wednesday back in Houlton.